Is it OK to buy a fake Rolex, Prada, or Burberry? Rolex watches, Prada satchels, and Burberry scarves are nice, but not that nice. For far less than these cost you can get similar items that keep time better, hold more, and keep your neck warmer. Rolex-, Prada-, and Burberry-labeled goods are so desirable because they are positional goods. That’s the economists’ term for products whose value lies in their scarcity. You can buy a genuine Rolex for $3960 at Amazon.com, or you can buy a knock-off at iReplicaStore.com for $115. Or on the street for $10. You won’t be able to tell the difference. The price comparisons for Prada and Burberry are similar. The real things sell for $1398 and $150, respectively, while the fakes go for $110 and $18 on the internet, much less on the street. So what’s a person to do? You can fool everybody for a tenth the cost. And you won’t be alone: lots of people do it, even brag about their ten dollar Rolex. But “everybody does it” doesn’t make it ethical. 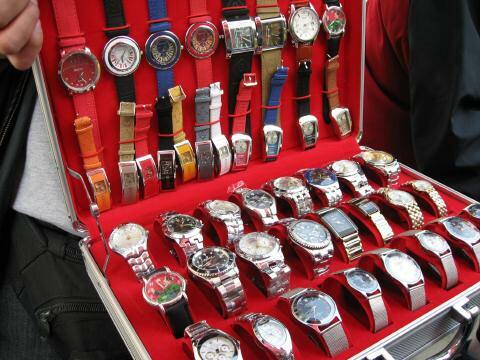 The law gives Rolex, Prada, and Burberry exclusive use of their designs and labels. It’s called their intellectual property. You’d be stealing the intellectual property of the real brand. An ethical person doesn’t do that. But maybe there’s another reason to shun knock-offs: you’ll know that you’ve got a fake. Will you feel worse for your deception, rather than better for impressing your friends? This week’s Economist reports on a series of experiments at the University of North Carolina that demonstrate that sporting knock-offs is bad for the cheater. It makes one more likely to cheat in other circumstances, and worse, it seems to lower, rather than raise, the self-esteem of the cheater. What’s the point of having a fake if it makes you feel bad? In this case, ethical behavior really pays off. This entry was posted on July 1, 2010 at 5:38 pm and is filed under Business ethics, Ethics-general. You can follow any responses to this entry through the RSS 2.0 feed. You can leave a response, or trackback from your own site. So I guess Ethicsbob would disapprove of his daughter shopping for Kipling bag knockoffs for holiday gifts for her family while on vacation in Vietnam…..
I’ll change my shopping list. No, Ethicsbob’s daughter can do no wrong. He’d never disapprove. So I guess Ethicsbob would disapprove of his best Turkish guide let clients buy knockoff everythings from the Grand Bazaar… I’ll change my walking route in the bazaar. I don’t think you should try to stop your clients from buying in the Bazaar. Heck, I know one of your pals bought a Fenerbahce shirt in the Bazaar, and wears it around Los Angeles. Hmmm, maybe it was a knockoff. When you’re in a society that has a set of rules that differs from yours you just have to decide who you are. My favorite carpet dealer decided years ago that his sense of ethics didn’t allow him, when asked the price of a carpet, to say $1000 when he was really willing to sell it for $600. So now he sells fixed price, and has done quite well for years. Hi, just stopped by doing some research for my Prada website. Truly more information than you can imagine on the web. Wasn’t what I was looking for, but interesting page. Have a great day.